It was a late night decision to go fishing, in fact it was on then it was off then it was on again. This was due to the weather forecast which was hinting at a good plummeting of rain in the hills that feed the river we were planning to fish. To top this off Jim sent me a text saying one of the guys had passed the river earlier in the day and it was looking high and dirty. We took the executive decision to leave it until the morning to check river level updates, the weather and the forecast. A gamble was made and off I set to pick up Jim. If you go conditions may be crap and you might not catch, if you don’t go you definitely won’t catch. 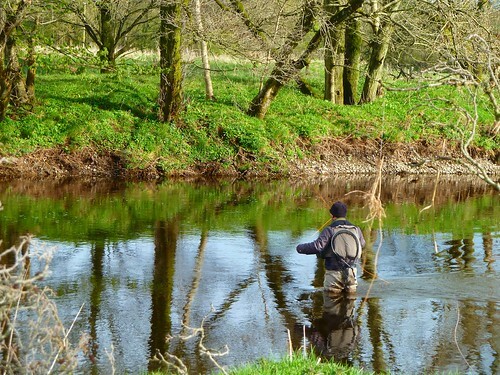 We weren’t expecting much so we were pleasantly surprised to find a river that wasn’t too coloured and wasn’t too high – prospects looked better than a day consigned to streamer bashing! We set up (streamer bashing!) to fish a few runs and pools before heading to a more likely spot for the expected afternoon hatch. I managed a whopping nothing on the streamers but Jim had a good bump which didn’t stick – it’s like that when you’re streamer fishing. The most spectacular part of the morning was the weather, we had lovely sunshine which began to cloud over and then the hail came. The heavens opened with the largest hailstones I have seen in a long time, they were bouncing from the ground and heavy enough to turn the whole river white. They bloody hurt too! Once the very considerate ice balls stopped falling from the sky is was fly and rise hunting time. It didn’t take long, actually, the minute the rain which followed the hail stopped, the game was on. There were plenty march browns coming down and there were a number of good fish rising. I was on strike (lucky me!) and second cast stuck a fish on a CDC dun which was on for a short time. I didn’t think much of it at the time, this was my first good trout since NZ and it didn’t feel much but looked sizeable side on in the water. Sods law he slipped the hook and I lost my temper, just slightly though! At least there were more fish rising and it wasn’t long before I landed this fish at 3 1/4lb on the scales. It didn’t fight as hard as the first fish which definitely looked bigger but hey since that first fish wasn’t landed it is nothing more than a fisherman’s tale. Jim was incredibly unlucky here and pricked two fish which didn’t stick. 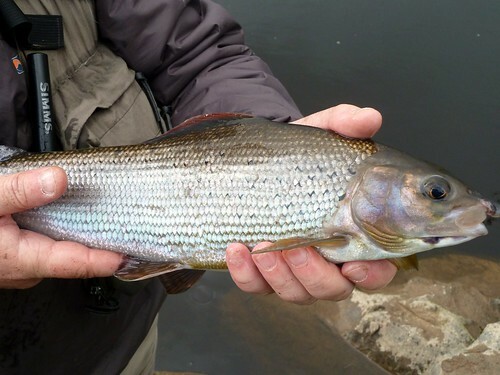 The hatch was quite short lived but we found the odd rise later on and Jim bagged this nice grayling. 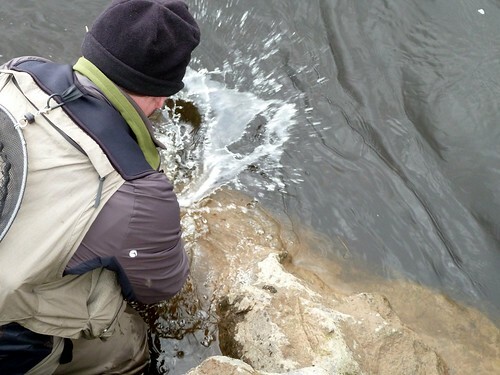 It wasn’t a bad day out given weather expectations and the hailstones but the main hatch was short lived and there wasn’t a massive number of rising fish. Still, can’t complain – it was a cracking fish. Not sure when I’ll next be out, need to study for a set of exams coming up in May but hopefully I’ll manage a day or two out. Well done guys,looked like a you got nice day after enduring that hail shower, a cracking trout and a lovely grayling for your efforts. Thanks Brian. You’re winning on the fish stakes though – gorgeous fish! Another fluke Scottie!! Clearly, the trout was suicidal!! People often confuse skill with being lucky! Haha! I’m looking forward to getting out once my exams are over. 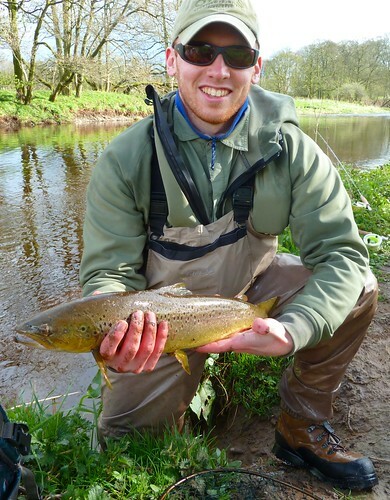 Lovely fish Scotty…..well done there and congrats to your mate on the grayling. Hope you are well….certainly looks so. Thanks for commenting Brian! I’m very well thanks, have managed plenty fishing this season so far after not getting out for the first week. Going to be a bit more curtailed for the next while unfortunately though. How have you been getting on? 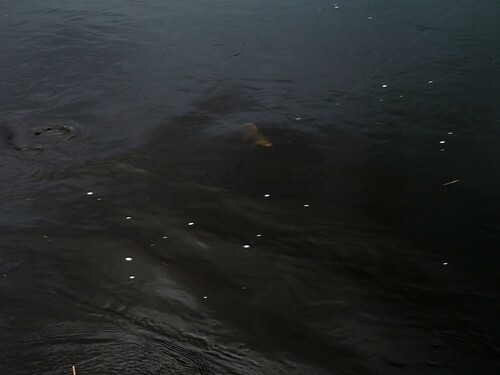 Need to get out for a fish together this season – too much talk and not enough action previously! I’m doing fine scott, thanks for asking. I’d been keeping tabs on the GAIA open day at Stirling but unfortunately I’m gonna be working that day. Might pop throughfor a lesson though if your’e up for it. Use my e-mail address to contact and we’ll get a session sorted.